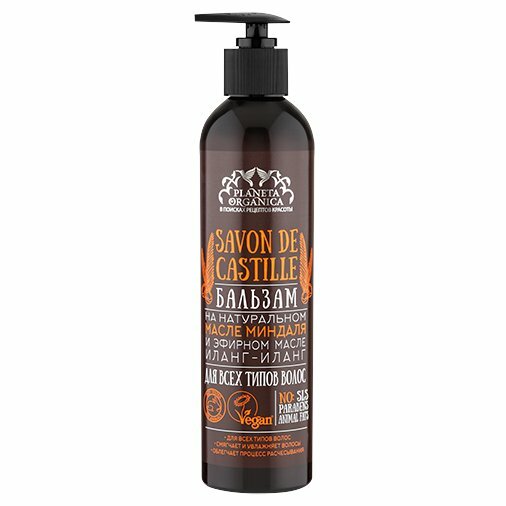 Savon de Castille Hair Conditioner is produced by the Russian beauty brand Planeta Organica for its Savon de Planeta Organica line. The product is formulated with natural almond oil and ylang-ylang essential oil. It excellently moisturises the hair and scalp, repairs damaged hair structure, makes the hair stronger, tamer and shinier. Suitable for all hair types. The product is formulated with ylang-ylang essential oil and palmarosa essential oil. Ylang-ylang oil prevents brittle hair and split ends, stimulates hair growth, and helps to repair hair structure damaged by harmful external factors such as heat styling, UV rays and sea water. Palmarosa oil has a refreshing and rejuvenating effect on the scalp, it helps to keep it hydrated and normalises sebum secretion. A blend of organic vegetable oils contained in the product (coconut oil, olive oil, almond oil, avocado oil, shea butter) nourishes and moisturises your hair and scalp, prevents dehydration, strengthens hair roots. Thanks to these oils, your hair becomes softer, tamer, and filled with strength and energy. Ingredients. Aqua, Cetearyl Alcohol, Cocos Nucifera Oil, Cetrimonium Chloride, Olea Europaea Fruit Oil, Behentrimonium Chloride, Prunus Amygdalus Dulcis Oil, Cananga Odorata Flower Oil, Persea Gratissima Oil, Cymbopogon Martini Oil, Panthenol (provitamin B5), Butyrospermum Parkii Butter, Lauryl Glucoside, Citric Acid, Benzyl Alcohol, Benzoic Acid, Sorbic Acid, Parfum, Cinnamal, Linalool, Eugenol, Benzyl Benzoate. Want to buy Savon de Castille Hair Conditioner? Call us or submit your order via our web site!